CONSEF is a Science and Engineering Fair that features a series of STEM competitions and expositions for students(Project/Poster Session & STEM Exposition). Last year more than 450 students from 41 different schools participated and we expect even more this year! 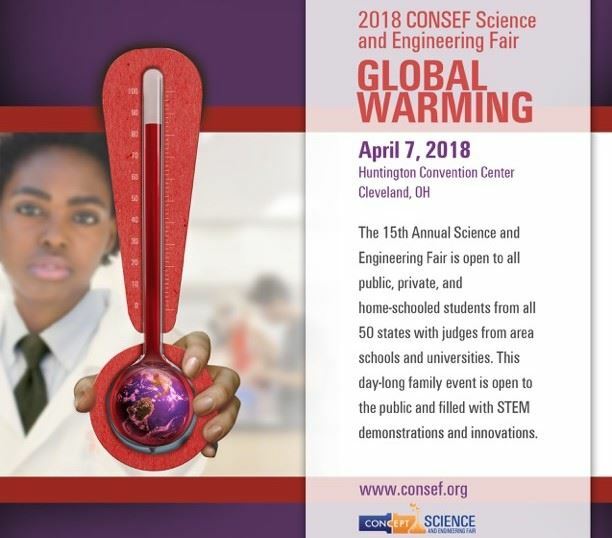 CONSEF will be held on Saturday, April 7, 2018 at the Huntington Convention Center of Cleveland, OH. All schools in the Midwest (IL, OH, WI, MI, MO, IN, MN). All public, private, charter, and home-school students. All students in grades 5 through 12. Scroll down to see more about these events individually or visit our website! Register for CONSEF's Project/Poster Session! If you would like to register your student for the Project/Poster Session of CONSEF, there's limited time left! Although, registration was extended exclusively for you! Register now through March 2, 2018! Not registering, but want to visit? The project/poster session is free, and open to the public between 12 PM and 1 PM CST. The STEM Exposition is an event designed to encourage students to showcase the results of their STEM studies and their science work. The purpose of the exposition is to apply knowledge and understanding of science, technology, engineering and math to conduct in-depth, “real-world” investigations and offer another venue for students to practice their presentation skills. The STEM Expo is open to all students, parents, and community members to enjoy hands-on activities. Explore the excitement and opportunities that science offers by visiting from 11 AM - 2 PM CST!